April is Oral Cancer Awareness Month. When many people picture oral cancer, they see an aged, long-term smoker. For those of us who remember the anti-smoking campaign commercials from the 1990’s, you recall testimony from smokers who had their larynx removed or large portions of their tongue. However, maybe you wouldn’t picture a young person who has never smoked struggling with the very same diagnosis as the seasoned smoker. Yet, this a group that is growing rapidly in instances of oral cancers due to the prevalence of HPV. Below are some facts you may not know about oral cancer. This is not meant to scare you but inform you. The Oral Cancer Foundation provides these facts and multiple resources on their website you might find interesting and helpful. Oral oropharyngeal cancer kills roughly 1 person per hour. Every hour. Just under 50,000 Americans will be diagnosed with oral oropharyngeal cancer, causing around 9,750 deaths. The death rate for oral cancer is HIGHER than other cancers such as cervical cancer and Hodgkin’s lymphoma. Unfortunately, oral cancers are often detected and diagnosed late, which likely contributes to its higher mortality rate. The American Dental Association states that about 60% of the US population sees the dentist once per year. 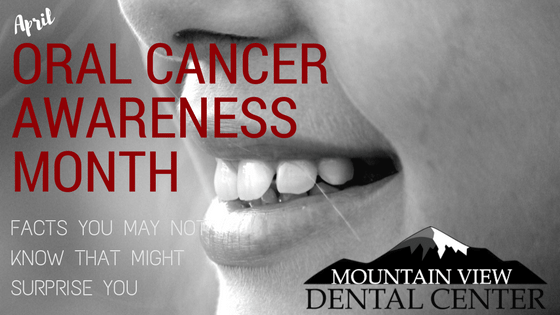 Besides a cleaning and overall oral health examination, your dentist and hygienist are also providing a visual screening for cancer and can be the first line of detection for this deadly cancer. Approximately $3.64 billion is spent in the United States each year on head and neck cancers. These are the costs associated with direct treatment expenses without considering the societal burdens and indirect expenses of treatment. The costs are expected to rise if everything remains the same. Young people who have NEVER SMOKED or used tobacco are getting diagnosed with oral cancer. The human papilloma virus (HPV), particularly HPV16, is conclusively implicated in the increasing incidence of young non-smoking oral cancer patients. It may even be replacing tobacco as the primary causative agent in the initiation of the disease process in people under 50 years old. Oral cancer affects the black population TWICE as often as the white population. The survival statistics are also poorer over 5 years which is 33% for the black population and 55% for the white population. These statistics have not taken into consideration socio-economic factors like income, education, availability of health care, or increased use of tobacco and alcohol. Those who smoke and drink have a 15 TIMES GREATER RISK of developing oral cancer than others. Tobacco and alcohol act synergistically which greatly increases the occurrences of oral cancer. Tobacco and alcohol use are chemical factors but can be considered lifestyle factors. Oral cancer often goes unnoticed. As in most cancers, early diagnosis is key to survival. The reason oral cancer goes unnoticed is because it is often painless and the visible signs can be fairly small physical changes. It is important to be aware of what you see in your mouth and take note of any sore or discolored area which does not heal within 14 days. Regular dental exams give your dentist and hygienist the opportunity to check out any abnormalities, feel for unusual lumps and hear from you about any concerns in your mouth and neck. The earlier oral cancer is diagnosed, the greater the chances of survival are and the less costly overall. Mountain View Dental Center takes your oral health seriously and we provide regular screenings for oral cancer within the mouth and around the neck. When you come to see us for your regular cleaning, you may think it is just that, but it is much more. Your bi-annual exam gives us the chance to get a picture of your oral health which affects your overall health, as well as screen for oral cancer and, yes, give your teeth a thorough cleaning. If it has been a long while since you’ve visited the dentist, please don’t hesitate to call our office or feel ashamed in any way. We’re happy to see you and help with your needs, no matter how long it has been.